This was a relatively quiet year for coding changes for endovascular and interventional procedures. This article outlines the changes that took effect January 1, 2019. A new category III code was created to allow reporting of a procedure that is currently being studied in a clinical trial. This procedure typically uses a proprietary device but could be performed with available nontrial devices. The procedure would be reported with code 0505T, regardless of whether it is performed as part of a clinical trial. This service is typically performed to bypass an occlusion/stenosis, specifically in the femoral or femoropopliteal arterial segment, and involves the creation of an extraluminal endovenous/endovascular arterial bypass by the placement of covered stents. The adjacent femoropopliteal vein is used as a pathway for the endovascular bypass, and the service requires cannulation of the femoral artery in an antegrade direction plus cannulation of the vein from a distal access. A wire is passed from the artery above the occlusion into the adjacent vein, typically using a crossing device, with reentry into the artery below the occlusion. Covered stents are placed to create an endograft bypass around the occlusion. This service requires that the endograft uses the vein as its pathway. This code would not be used if an extraluminal channel is created that is not intravenous. For instance, it is not appropriate to use this code for an arterial subintimal recanalization. This code encompasses all aspects of the service, including ultrasound (US) guidance for puncture of the arterial and/or venous access sites. US guidance was included because it is likely that it will almost always be used, and 76937 (US guidance for vessel access) may not be separately reported. All catheterizations of the arteries and veins, imaging guidance, road mapping, intraprocedural angiography, completion angiography, cannulation of the artery from the vein and the vein from the artery (including use of a crossing device), balloon angioplasty, and stenting are included. This code is intended to be an all-inclusive code for this service. Coding for peripherally inserted central catheter (PICC) line services has been revised. When imaging guidance is used (US and/or fluoroscopy), a bundled code that includes PICC placement plus all imaging guidance will now be reported. 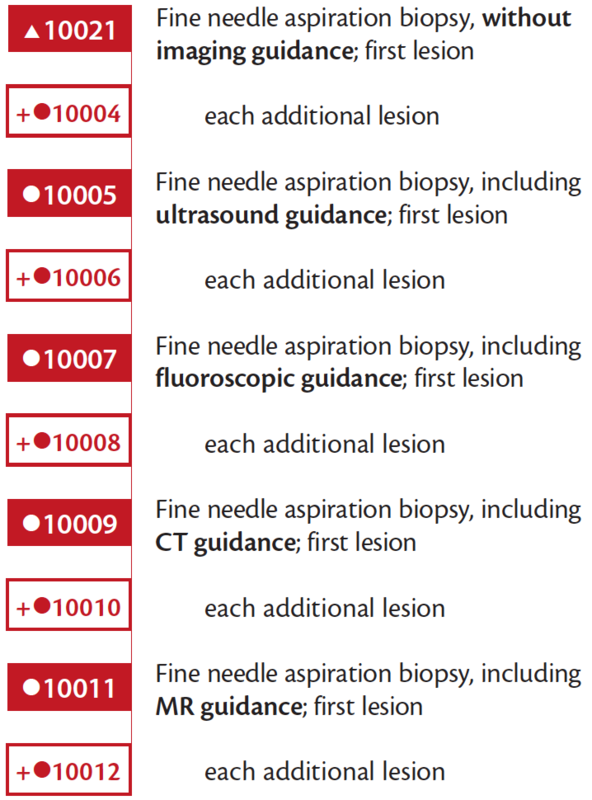 The bundled codes (36572, 36573, 36584) are reported when any imaging guidance (ie, only fluoroscopic guidance, only US guidance, or both fluoroscopic and US guidance) is used for a procedure. 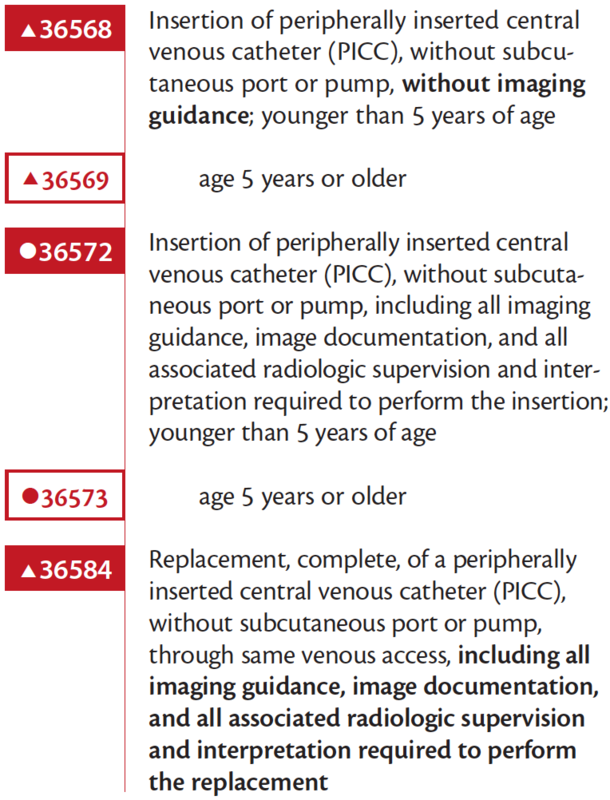 Codes for PICC placement without imaging guidance were retained in CPT but were revised to specify that they cannot be reported with imaging guidance codes 76937 (US guidance for vessel access) or 77001 (fluoroscopic guidance for central venous access placement/replacement), and hence, one may not report the components separately. No change was made to the codes for centrally inserted venous catheters, and no change was made to codes describing placement or replacement of PICC lines with subcutaneous ports. Codes for centrally inserted venous catheters and for PICC lines with subcutaneous ports are not bundled, and imaging guidance may be separately reported when performed with these services. The new bundled codes for PICC lines (36572, 36573, 36584) include confirmation of tip placement. A chest x-ray performed solely for confirmation of tip placement may not be separately billed by the provider who has placed the PICC. If tip placement must be confirmed using methods in addition to US and/or fluoroscopic imaging guidance, a reduced services modifier (52) should be appended to the PICC placement/replacement code to denote that the complete service was not provided. Venography performed through the same venous access is bundled with codes 36572, 36573, and 36584 and may not be separately reported. CPT also specifies that an image from all guidance modalities used should be stored in the patient’s permanent record. 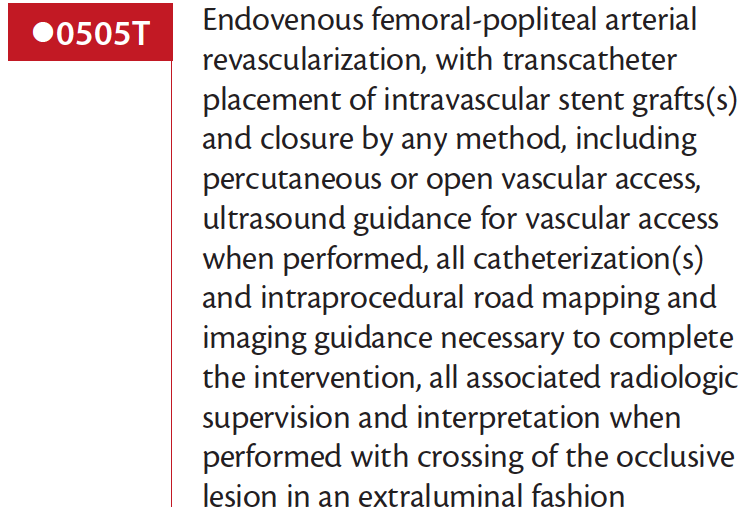 In addition, US guidance requires documentation of assessment of the access vein for patency and real-time visualization of needle entry into the vein. New codes for fine needle aspiration (FNA) biopsies will go into effect January 1, 2019. These codes bundle imaging guidance by modality. These codes now prohibit unbundling of imaging guidance when performed. Codes 76942 (US guidance), 77002 (fluoroscopic guidance), 77012 (CT guidance), and 77021 (MR guidance) may not be reported with codes 10021 or 10004–10012. These codes are reported once per lesion sampled. If multiple passes are made into the same lesion for FNA using the same imaging modality, the FNA code is reported once. If multiple lesions are sampled, multiple codes may be reported. The base code is reported for the first lesion sampled using one imaging modality. If the same imaging modality is used to guide sampling of multiple lesions, the add-on code for that imaging modality is reported for each additional lesion that is biopsied. The codes are not specific to site or organ but rather are differentiated by the imaging guidance modality utilized. Example 1. FNA of two separate right lung lesions are performed using CT guidance. Example 2. FNA of a right lung lesion using CT guidance is performed and FNA of an adrenal nodule is performed using CT guidance. If one imaging modality is used to guide sampling of the first lesion, but a different imaging modality is used to guide sampling of a second lesion, the primary code for each imaging guidance would be reported. Modifier 59 should be appended to the second primary FNA biopsy code. Example 3. A right lung FNA is performed using CT guidance, and a liver lesion is sampled with FNA using US guidance. If both a FNA biopsy and core biopsy are performed on the same lesion, both may be reported, even if performed through the same guiding needle. However, if the same modality of imaging guidance is used for both the FNA and the core biopsy, the imaging guidance is only reported once. If one imaging modality is used for the FNA and a different imaging modality is used for the core biopsy, both imaging modalities may be reported. Modifier 59 should be appended to the imaging guidance code for the core needle biopsy and to the core biopsy code. Example 4. FNA biopsy of a lung lesion is performed using fluoroscopic guidance for a lung lesion. A core biopsy is then taken of the same lung nodule using CT guidance. Example 5. FNA biopsy of a lung lesion is performed using fluoroscopic guidance. A core biopsy is taken through the same guiding needle of the same lesion, also using fluoroscopic guidance. If a FNA biopsy is performed on one lesion and a core biopsy is performed on a separate lesion using the same imaging guidance modality, the image guidance is reported for both lesions, appending modifier 59 to the imaging guidance code for the core biopsy. Example 6. FNA biopsy is performed using US guidance for a liver lesion. A separate liver lesion is biopsied using a core technique, also with US guidance. If a FNA biopsy is performed on one lesion using one image guidance modality and a core biopsy is performed on a separate lesion using a different image guidance modality, both image guidance modalities are reported, appending a 59 modifier to the imaging guidance code for the core biopsy. Example 7. FNA biopsy is performed on a cervical lymph node using US guidance, and a core biopsy is performed on an axillary lymph node using CT guidance. New and revised codes are being introduced January 1, 2019 for interprofessional consultations performed using the telephone, internet, and/or electronic health record. These changes include modification of existing codes for telephone/internet consultation codes for the consulting physician/qualified health care professional (QHP) (99446–99449), the addition of one new code for the consulting physician/QHP (99451), and the addition of one new code for the referring physician/QHP (99452). The codes are time-based. 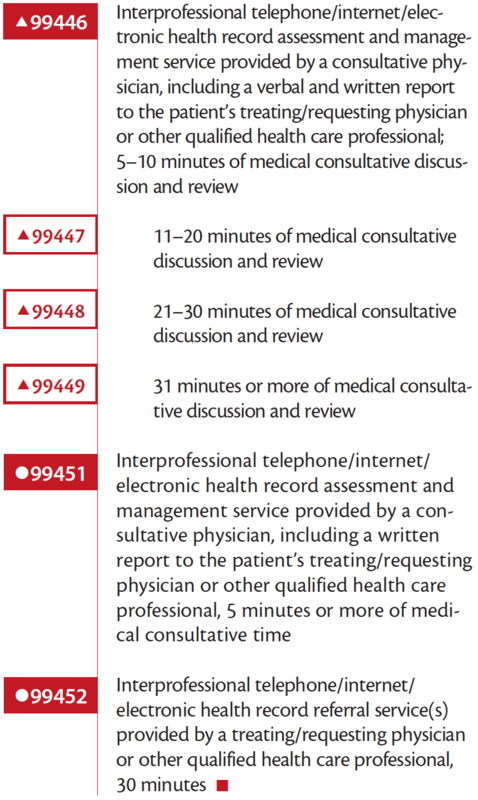 For the referring physician (99452), physician time spent in collecting/organizing/sending data, talking to the consulting physician, and completing the referral for consultation is reported with 99452 if the physician time spent is 16 to 30 minutes and is not time included in a patient visit reported with a separate evaluation and management (E/M) code. For the consulting physician, these codes are intended to include assessment and management services in which the referring physician requests the opinion and/or treatment advice from another physician to help with diagnosis and/or management of a patient that the consulting physician does not see face to face. These codes are reported based on total time spent. More than 50% of the total time should be spent providing verbal and/or internet communication, with the referring doctor providing the assessment and management portions of the service. Time spent reviewing records (ie, imaging/lab results, medication records, medical records) is included in the cumulative time. However, if more than 50% of the time is spent reviewing records, the service does not qualify as a medical consult, and these codes would not be reported. Codes 99446–99449 require both written and verbal reports to the referring physician. Code 99451 requires only a written report, which may be provided in the electronic health record, secure portal, letter, etc. Services requiring < 5 minutes are not reported. If the consultation results in a decision for the patient to be seen by the consulting physician, these codes would not be reported, and the services provided would be included in the E/M coding for the in-person consultation. If the consultation is solely to arrange transfer of care or other face-to-face service, these codes should not be reported. The Centers for Medicare & Medicaid Services has expanded access to care using telecommunications by announcing coverage of these codes for 2019. CPT has additional guidelines regarding specifics for use of these codes. If you have any questions or topics you would like Dr. Krol to address in a future column, please contact us at evteditorial@bmctoday.com.